As part of some recent investigation about Bus Stops in the Twin Cities, I wanted to find out how many bus stops there are in various cities. Sadly this information has not been pre-compiled on the Web … until now. This is the first list of bus stops by transit system that I know of. It is of course, incomplete. Feel free to add information in the comments (with references, and system definitions as necessary), I will try to update the list periodically. Also feel free to add this information to Wikipedia to preserve this information for posterity. It is time to rail about the sorry state of bus stop signs in the Twin Cities again.I have talked a lot on my blog about bus stop signs, and we have talked about this on Streets.MN. On “A Streetcar Named Development”, Streetcars, Buses, and Signs Was probably my first post on the topic, and compared signs in Minneapolis with those in London (where I was living at the time). Minneapolis officials were arguing for rail saying “With rail, you know where you’re going,”, which is an easily solved problem with decent signage, but which nearly 7 years later has yet to be solved. 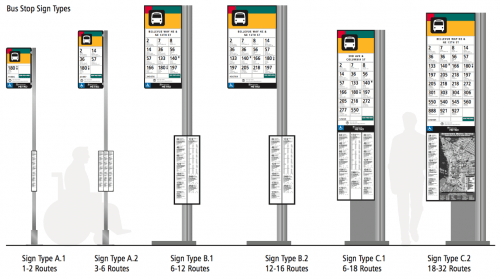 Seattle Metro’s New Bus Stop Signs – are very informative, with at least schedule, bus numbers, and some with maps. Seattle’s transit mode share is twice the Twin Cities. 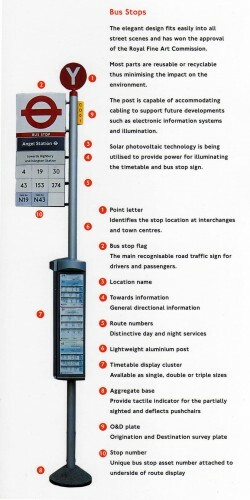 An Assessment Scale for Travel Information at Bus Stops – allows us to objectively rate the quality of information conveyed on bus stop signs. Sadly the Twin Cities does poorly. 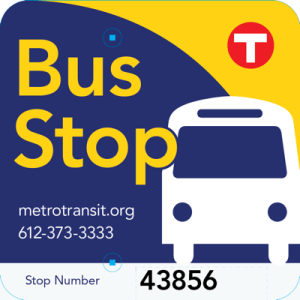 UMN Campus Shuttle Signs – use QR codes and identify stop #, which links to Next Bus. The signs are not well placed, and are ugly, but the system has only one route. These signs are nevertheless better than the regional signs which are co-located. Metro Transit Sign Test – is a small glimmer of hope that Metro Transit would like to do something better with their signs, by putting a phone number, website address and stop number on their signs – which may be adequate if you have a smart phone, and are looking at it constantly. They still miss the basic information, and do nothing to reassure me that I will be able to get home from a new destination. Others have written about bus stop signage as well. So why do I keep complaining, when clearly this does no good. I have raised this with the highest levels of Metro Transit and the Metropolitan Council, so this is not something they are unaware of. It is just insufficiently prioritized. The head of Metro Transit pulled out a smart phone when asked this question in a public forum. To be clear, smart phones are better than no smart phones, but they are not sufficient. For one, not everyone has a smart phone. For another, we shouldn’t need to look at a glass screen to get basic information, we should be able to focus on the environment around us. For a third, we don’t have evidence that these are reliable yet: My battery could die; My app’s cloud service could go down. For a fourth, that only helps users, and does not inform non-users. Bus stop signs are information for travelers. They are also marketing to potential travelers. For every time someone sees a bus stop sign when making a trip, hundreds pass by who are not making a trip. They may still look at the sign and see information. Over time that information will sink in, and they will get a sense of what routes go where. People will begin to develop mental maps of the transit system. It will give them confidence to use the system that a simple “Bus Stop” sign does not. I would promise to stop haranguing about this if I got numbers 1-9 above everywhere in the Twin Cities. These things are standard in many European cities, where transit is taken seriously. In London, all the stops have the information described. In Helsinki all the stops have this information and shelters. Maybe there is other information we want as well. Feel free to comment below. How much does this cost? Of course the answer is it depends. There are lots of factors. But let’s imagine it costs $2000 per bus stop to design, print, and install decent, London-level signage (not including benches or shelters). Wikipedia suggests $100-$500 for street signs, but clearly these are costlier, since each has some custom information. The cost in New York for Street Signs was about $100 installed, but that is New York. Lancaster, Pennsylvania purchased 2000 signs for $21K, or $10 each, including route identifier decals. London has a bus stop average cost of replacement of £1475. For 13,000 signs, this would be $26 million. This of course would need to be updated as information changes, so let’s assume $100 per year (or $1.3 M) system wide (since not all information changes at every sign every year, most details remain the same. (Compare today’s bus route map with that from the streetcar era, it is eerily similar.) This is well less than the cost of 1 mile of LRT, or the cost of 2.5 parking ramps, and benefits the whole system. Is this worthwhile? The evidence suggests yes. The paper “EFFECTIVE WAYS TO GROW URBAN BUS MARKETS – A SYNTHESIS OF EVIDENCE” by Currie and Wallis in the Journal of Transport Geography (free earlier version) suggests revenue grows more than twice as much as cost from bus stop improvements and high quality signage (Figure 1 in the free version of the paper), and that this was more important than real-time information or new buses. This produced a 6-17% increase in ridership. Is this the only thing agencies should do? Of course not, there are lots of strategies. But using economic reasoning, everything with a benefit/cost ratio above 1.0 should be done. Network effects suggest this needs to be done everywhere to be fully effective, not just at origins. While some stops are better than none, I need to have confidence that not only I can get on the bus where I am starting, but get back on at my destination for the return. How to pay for this? My simple answer, put a sponsorship sign at the bottom. (This stop sponsored by Streets.MN, proudly providing the best forum for transport land use information in Minnesota). Given the rates people pay for bus shelters and benches (which are much bigger and costlier of course), there should be lower rates people would pay for smaller signs for a longer period which cover the cost. A private firm should be willing to take over bus stop management in exchange for the advertising revenue. Hopefully they would do this while paying for the privilege rather than demanding a subsidy. (Certainly the busier stops would be profitable for them, and less busy stops unprofitable, hopefully the profitable stops outweigh the unprofitable.) I realize people don’t want more ads in their environment, but the alternative is paying for this from fares, or public coffers, or not having it at all, and the evidence to date is that not having it at all is the outcome. There are lots of design details. There is no guarantee that London or Seattle has the perfect answer. But before we can argue those, we need to have the commitment to do something rather than nothing. We can’t do it everywhere at once, but that doesn’t mean we cannot do it anywhere ever.